Thieme has contributed a great deal to the literature on temporal bone dissection, with such recent titles as Temporal Bone Dissection Guide (Francis and Niparko) and Atlas of Temporal Bone Surgery (Ulug), to name only two. I did won- der if this book would contribute anything further and am glad to say it does. 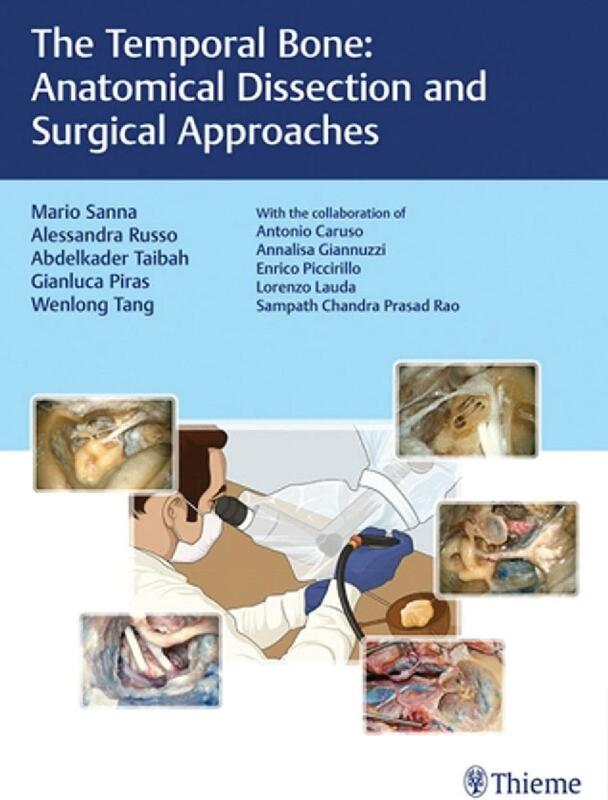 Basically, it delivers what the title promises; it manages to combine a guide to laboratory temporal bone dissection with a very practical approach to real-life surgery.Prof Sanna tells us, in the introduction, that his early training provided little access to temporal bone dissection, but this gave him the marvellous opportunity to travel to Los Angeles and Zurich for enhanced experience. Many of us will recall a period, in the 1970s, when UK temporal bones were abundant, but facilities consisted of a clapped out drill, a microscope from the Ark, all in a damp basement. This reviewer recalls arriving at the University of Michigan, Ann Arbor, as a trainee fellow and benefitting from their Temporal Bone Dissection course. The mind was particularly concentrated on learning, halfway through, that the return for this was to demonstrate on each subsequent course! Most units can still claim to offer a laboratory, if not the bones themselves; as a result, entering the room involves passing through dense cobwebs. Temporal bone dissection now is largely a group exercise, organised by the training university, or an international course, usually in an exotic location. There is still, however, that need to develop one’s skills informally and relatively unsupervised, and this is where guides, such as this, are invaluable. Thieme published a very similar title, with almost the same authorship, in 2005. Prof Sanna is truly an industrious author. The book carries 150 references, and it is notable that references 90–142 relate to his own work in peer-reviewed journals and books! The book opens, as do all similar texts, with the temporal bone laboratory set-up, followed by the basic anatomy, the osteology, and middle- and inner-ear structures. The lavish illustrations, which are in full colour, with between five and six images per page, represent cadaver and temporal bone dissections throughout. The text, however, does concentrate on surgical steps, with bullet points, and hints and pitfalls, which I found detailed and well thought out. I would particularly highlight the paragraphs on the indications for each of the surgical approaches covered. It makes a nice change from the all too common ‘because I have always done it this way’ response, when asked about choice of technique. Coverage progresses from tympanomastoidectomy, through cochlear implantation, and on to the translabyrinthine approach to the cerebellopontine angle. ‘Facial Nerve Decompression’ is one of the best accounts I have read of the stages involved in this surgery, again illustrated by cadaver dissection. The second half of the book covers very advanced neuro-otology, and few readers will ever go beyond such surgery on anything but ‘dead ears’. This is then, largely, an atlas, a visual manual for turning temporal bones into dust, of which there is no lack. What I found novel, and really liked, was the accompanying surgical wisdom, presented in such a readable style.